Get started for Seaweek 2004! Our oceans are the home of the mighty and mini, the weird and wonderful, the amazing and unimaginable. Seaweek 2004 is going to help to explore just some of these marine and coastal plants and animals. As well it will help you consider what else you may discover in the sea like marine debris (eg our rubbish and tourist trash) and how you can take action to minimise this unwanted sea dweller. Visit this website leading up to Seaweek 2004 and discover more about our ocean habitats and inhabitants. Look our for information, images, issues and web links and get ready to take part in Seaweek 2004 March 7th to 14th next year. These three marine animals are found at Lord Howe lsland, where is this island? 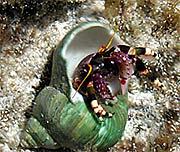 Match the name to the photograph, which is the Urchin, Hermit crab and Clam? Which part of the ocean do they live in? Name one special feature each of them has to survive in the marine environment. I am a land plant that has developed a number of adaptations so I can live in intertidal regions. I become more common as you travel north along the Australia coast. I can withstand tide and wave action and help to control floods. I can exclude or excrete salt. I grow roots above the ground. I offer habitat or food and shelter for many other plants and animals. In fact my habitat and I are the vital element for fish nurseries.